The terrifying sights and sounds of crashing metal and men were recalled by the construction workers who survived the collapse of the Ironworkers bridge, 60 years ago exactly, at a memorial event on Sunday afternoon. On June 17, 1958, just before quitting time, foreman Lou Lessard suddenly felt the bridge he was building fall out from underneath him. The ironworker was sent plunging into the cold Burrard Inlet, along with 78 other men, with tonnes of twisting metal contorting all around them. “I fell anywhere between 135 to 150 feet when I hit the water, but I didn’t fall through the structure. So that’s what saved my life,” the 89-year-old told CTV News. Some had their legs and arms snap instantly, while others were dragged down into the deep by their tool belts. Lessard sank 10 metres and struggled for air. All he could see was a black cloud. The catastrophe was one of the worst B.C. workplace disasters in history, and a crowd of ironworkers, their families and dignitaries gathered to remember the story. Bagpipes drew emotions too. At the time of the crash, Byron Maine, now 85, watched his friends and crewmen crash into the water with horror. He was on the still-standing third span, and six decades later, considers himself extraordinarily lucky. He jumped in with the rescue effort with others, and it was grim. “There were a lot of men there that they didn’t touch, because they were dead. It was horrible to see. It’s something you don’t want to experience again,” said the octogenarian. A Royal Commission concluded an engineer used the wrong formula to determine the strength of the steel. The senior supervising engineer also did not see the mistake. Both were on the bridge, and both were killed, to a total of 18 dead men. Adding to the tragedy, a diver looking for bodies got caught in the twisted steel and drowned too. Then, four others were killed when the bridge was re-built. The bridge, now used by hundreds of thousands of motorists annually to transit between East Vancouver and North Vancouver, claimed a total of 23 men in its construction. 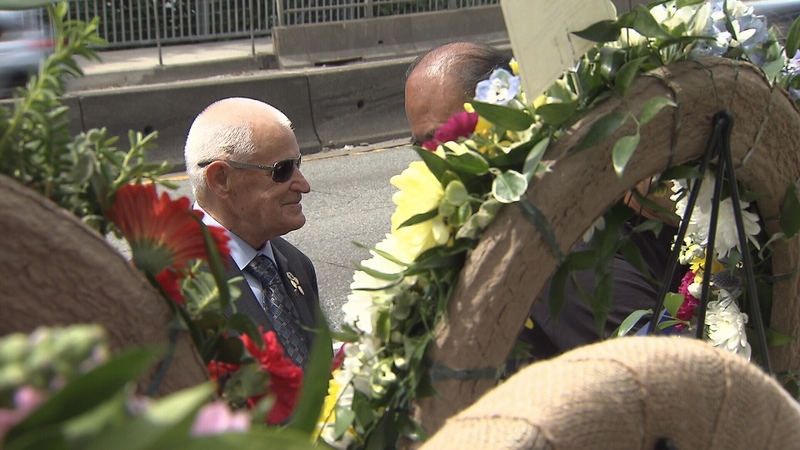 Former premier Mike Harcourt said he used his “premier’s prerogative” in 1994 to rename the bridge to the Ironworkers Memorial Second Narrows to honour the lost workers. He said the story of the crash is a reminder that construction work is dangerous, and men and women still can and do lose their lives. The ironworkers union says the workers are gone, but not forgotten. “A lot of the families need [today’s ceremony.] They need to know that we're still there and we support them,” said union president Ironworkers Local 97 president Paul Beacom. The number of workers killed each year in B.C. has ranged between 164 amd 228 in the past decade, according to a recent Work Safe BC report.